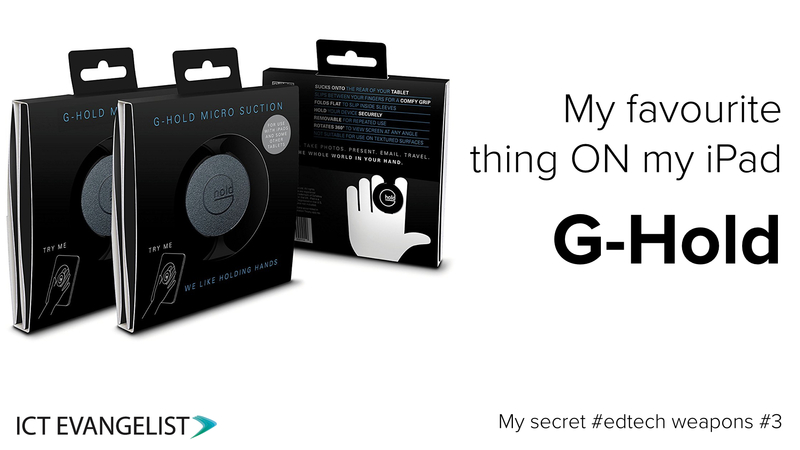 In my series of secret #edtech weapons, for my third post I thought I would share the amazing G-Hold that I have on my iPad. I was approached some time in 2016 by Alison Grieve on Twitter. She had developed a product to go onto your tablet which she called a ‘G-Hold’. The G-Hold essentially goes onto the back of your tablet and enables you to hold your tablet more safely in your hand without the risk of dropping it. I was immediately struck by this as I had previously had a case on my iPad 3 which had done something similar but hadn’t found anything that did this since I had upgraded my iPad. Alison agreed to send me over a few G-Holds to have a play with and they arrived the next day. If I’m honest, when they arrived, whilst they looked great, so forth and so on but I had some initial scepticism particularly about whether or not it would drop my shiny new iPad Pro and then doubly when I had some trouble in fixing it on. Alison was great and agreed to Skype with me to give me a hand. Through no fault of the product and with Alison’s help, the G-Hold was fixed to my iPad in moments and it hasn’t come off since. As you can see above the G-Hold fixes to the back of the device either on the tablet itself or to a pre-existing case. It grips on using suction rather than glue or anything else and it really is well and truly on there. 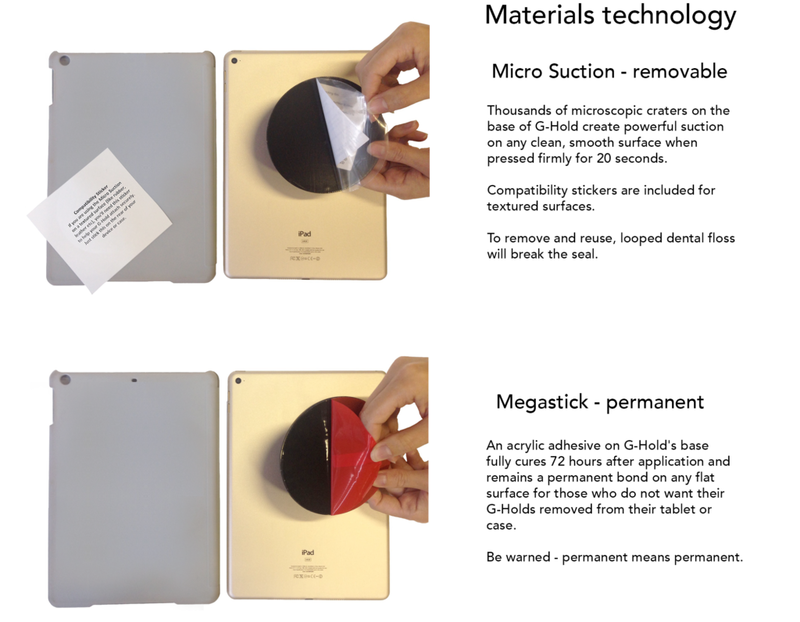 That said there are permanent ‘megastick’ options if you really do want to have your G-Hold stuck to your tablet permanently. My initial scepticism about the G-Hold meant that I didn’t write about it or share it straight away. That was almost a year ago now and whilst I had that initial scepticism, particularly about it staying on my tablet and coming off while I was holding my iPad whilst using the G-Hold, now – with it *never* having come off, I couldn’t be happier. It is so helpful when using my iPad. Whether I’m using it whilst presenting, teaching, taking a photo, drawing some sketch notes, so forth and so on, it makes holding the iPad easy and it’s pretty comfortable too. 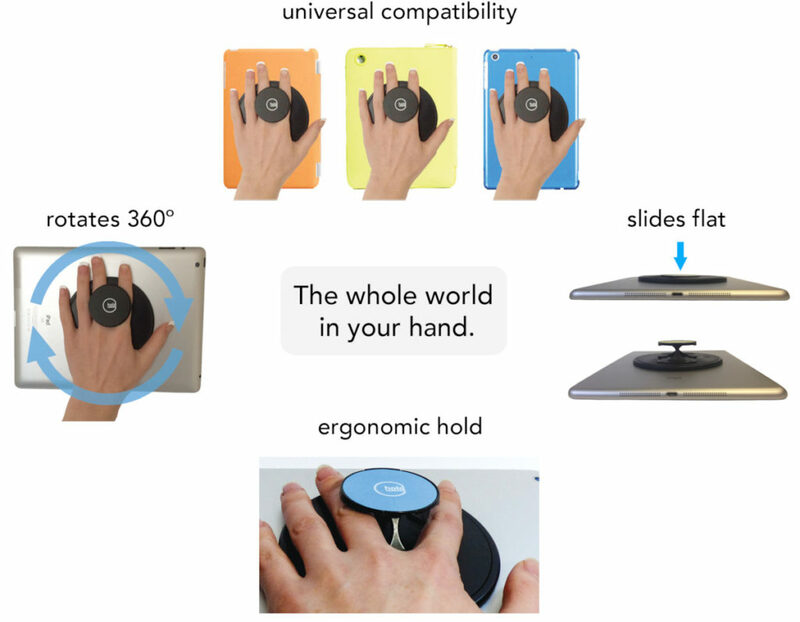 Another feature of the G-Hold which is really handy, particularly in comparison to some of the cases out there which allow you to slide your whole hand in for a similar experience is the fact that it allows you to rotate your iPad 360°. This is really helpful when you want to move from landscape to portrait or vice versa, something which with other fixed support bands you can only do by moving your wrist. The ergonomic design of the G-Hold means you can take the strain off your wrist and just use the device to help you with this, reducing the impact/risk of repetitive strain which will definitely be welcome with tablet users who use their devices a lot. For clarity, Alison sent me my G-Hold and so I was fortunate enough to be given one to try out. This post is not sponsored and I was clear with Alison that her sending me a G-Hold would not necessarily result in a post on ICT Evangelist, let alone a positive one – it has taken about ten months for me to post this so that I could ensure that anything I have written would be a personal and honest reflection of using the G-Hold on a daily basis. I just love it! The G-Hold is my favourite thing on my iPad. I couldn’t be happier with it and so if you’re looking for something to help you in this way, I can highly recommend it. It is definitely my favourite thing on my iPad and despite Alison not getting the investment on the product when she took G-Hold to Dragons Den, she now has backing from Apple, Microsoft and many other institutions from around the world. I can easily see it being available from the shelves of your local Apple store soon and I understand that Microsoft are endorsing it for use with their Surfaces too. For more information on G-Hold, please visit Alison’s site here. If you wanted to buy one from Amazon, they’re currently retailing at £22.50 and can be found here.